John Carpenter has certainly made a few unusual films in his time, but one that really stands out in my mind is Escape From New York. Although on the surface it looks like some basic action/thriller movie, it seemed to come out as more of a strange sort of social satire with memorably bizarre characters. It also marks the second collaboration between Carpenter and actor/friend Kurt Russell, both of whom worked together previously on a made-for-TV Elvis Presley biopic. As the film opens, we learn, thanks to narration from an uncredited Jamie Lee Curtis, that by the year 1997 (you know, the FUTURE) crime has gotten so bad that all of Manhattan Island has been transformed into a giant, self-contained prison where inmates are simply dumped and left to lead whatever life they can on the abandoned island. The applicable phrase being: "Once you go in, you don't come out." In the early moments, Manhattan Prison security, led by Captain Hauk (Lee Van Cleef) discover that Airforce One has been hijacked by a radical political group. They crash the plane into the prison, but the President of the United States (Donald Pleasance) manages to survive by ejecting in an escape pod. With almost no options for rescuing the President, now taken hostage inside the prison, Hauk turns to new inmate 'Snake' Plissken to do the job. Convicted for robbing the Federal Reserve, Plissken reluctantly accepts the offer for a full pardon. Unfortunately, part of the deal is that if Plissken doesn't save the President in a set time limit, he'll be killed by micro-explosives planted into his body. Tough break, no? So, with that, Plissken uses a glider to get into the city where he discovers a strange world inside the prison. Manhattan is filled not so much with hardened criminals, but more like social outcasts. In order to locate the President, he must make his way through this twisted world where everything is controlled by the 'Duke of New York' (Issac Hayes). If it sounds kind of goofy, I guess it is to a certain extent, but that's the real charm of the film. The unusual characters that populate the prison are basically what make the film. Though Escape does have a few good action sequences and well crafted stuntwork, most of the enjoyment comes from the effective and strange world. Without it's cast, Escape would be nothing, but thankfully that's not the case. The central figure of Snake Plissken is, essentially, Kurt Russell's attempt at the silent, loner type. Like Clint Eastwood's classic "man with no name" character, Plissken is sort of an exaggerated satire of that archetype, complete with eyepatch, stubbly beard, and military fatigue pants. Many Carpenter regulars pepper the film, including Tom Atkins in a very small role and Donald Pleasance as the President. Even Season Hubley (who played Priscilla Presley in Carpenter's Elvis) makes a brief appearance. From Harry Dean Stanton, to Issac Hayes, to Adrianne Barbeau, to Lee Van Cleef, this film simply drips with a superb cast that performs at a level of precision that really makes everything work. Obviously, a veiled social commentary lies underneath the basic story. I don't think John Carpenter or anyone else making the film actually took the plot too seriously. Turning Manhattan into a giant prison seems more like a joke about the level of crime there than anything else. The film is also set during World War III, with undertones of how the United States government is slowly transforming the country into a dictatorship. 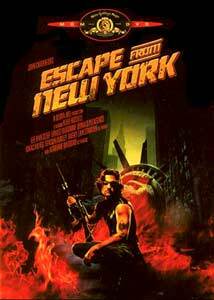 Escape From New York is really an escape from average action films, with a clever, wild plot and lots of character. It's far from perfect, but it's darn entertaining. Image Transfer Review: Escape From New York is a double sided disc, with a fullscreen presentation on one side, and widescreen on the other. The anamorphic widescreen side is certainly a drastic upgrade of previous releases. While a few moments, mainly scenes with mattes or special effects photography, have some slight artifacts and pixelization, the remainder of the film is completely clean and crisp. No unwanted movement is present, and even scenes with lots of smoke and fog come across with no errors. Black level is sharply defined and colors are warm and don't bleed, even in the muddier scenes (of which there are a lot). While the same can be said of the full frame side, the loss of image composition is awful. This is my first time viewing Escape in widescreen, and the improvement is dramatic. So much is lost in the fullscreen version, I can't recommend it much. The French and Spanish subtitles are nicely presented in yellow. Audio Transfer Review: The Dolby 2.0 Surround audio track is much better than I expected. In fact, it puts a lot of Dolby 5.1 remasters on older movies to shame. While front channel-based, the track has a lot of directionality and vibrance. It comes off sounding very clear and theatrical, with perfect balance between center channel material and the fronts. Surround channels are used quite a bit for a variety of ambient effects, and a good bassy, low-end provides just the right amount of punch to explosions and such. It also makes the throbbing, synthesizer musical score by John Carpenter really come alive. Extras Review: Unfortunately, this disc is a small step above a big goose egg as far as extras and presentation. For starters, the menu is simply a static screen. Is this a first generation disc? No, and despite MGM's usually flamboyant menus, none of that is here. MGM has also made a habit of little, informational booklets with their discs, but not here. Now, a few years back the so-called "director's cut" of Escape came out on VHS. It turned out not to be a "director's cut," but rather featured a making-of featurette which included the cut footage from the film; namely the actually filmed sequence where Plissken robs the Treasury. Not only is that featurette gone now from the disc, but none of the cut footage is here. I think we can all agree that a DVD that has downgraded extras from its VHS counterpart is a sad thing. So, all we get after years of waiting is a trailer. Note to all video companies who hold the rights to John Carpenter movies: please see The Thing and In The Mouth of Madness on DVD for a clue. Despite being such a bare bones edition, John Carpenter fans will at least have the pleasure of owning a high-quality version. Carpenter and Russell would later put together the self-mocking and satirical Escape From L.A. which basically made fun of this film. Both together make a wonderful set of unconventional action films. Recommended.